One of the things I love about eating winter squashes and sweet potatoes is that they help alleviate sweet cravings. By training our bodies to enjoy the subtle sweetness found in these vegetables, we can wean ourselves away from the intense sweet flavor we find in white sugar and processed foods. And when you add salt to the squash or sweet potatoes, you get the totally satisfying combination of salty and sweet. It’s enough to make me rethink my position on cold weather. 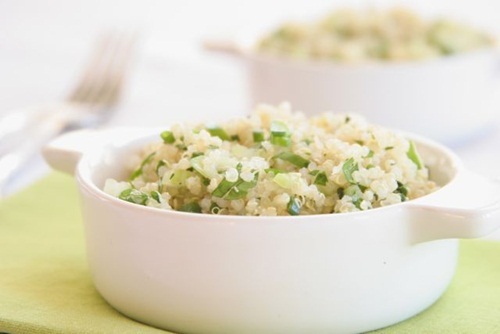 In a small saucepan, add 2 cups of water or chicken stock and 1 cup of rinsed quinoa. Bring to a boil and reduce to simmer. Continue to simmer until all of the water is absorbed and the quinoa becomes clear, about 15 minutes. Mix the sweet potatoes and butternut squash in a large bowl with 2-3 tablespoons of olive oil or enough to lightly coat each piece. Sprinkle with sea salt and mix again. Spread the vegetables in one layer onto a cookie sheet. Place in the oven and bake for about 20-25 minutes, turning the pieces midway through cooking to ensure all sides are cooked evenly. The veggies should be soft and lightly browned. While the quinoa and vegetables are cooking, prepare the sauce. In a medium bowl or food processor, combine the garlic, ginger, almond butter and tamari soy sauce. If using a food processor, chop the garlic and ginger before adding the wet ingredients. Add more tamari or almond butter until you have a smooth, creamy sauce. You may also add a few tablespoons of water to thin the mixture. Combine the cooked quinoa, squash, sweet potatoes and sauce. Enjoy!